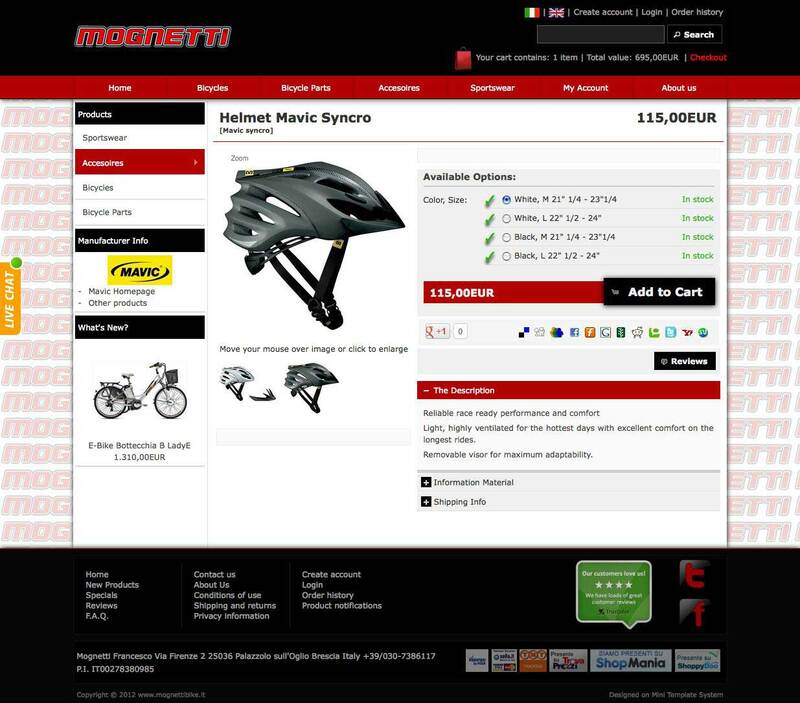 Mognetti bike is a store dedicated to eveyone who shares the passion for cycling. The store specializes in bicycles, cycling technical apparel and cycling accessories, all of which have been tested by the owner himself and his travel companions . What we added, on top of the existing modifications, was USU 5 by FWR media – that is a system to get nicer urls – and our own modified version of QuantityPro – a system to track attribute quantities. We did also some smaller modifications, like a quatity input box on the product information page, a small modification to use the products url field for additional pdf information material etc. The store has also mailbeez installed, this is a powerful email marketing tool included by default in all mini template system stores. The front page is setup using the front page manager and include 2 banner modules and the categories module: The first banner module shows a slideshow with text on the right of the image. After that the categories front page module, that is set to display the 4 top level categories. The categories name is on a transparent background showing an “exanding” effect upon hover, this is something that will be available in the next MTS versions, for now it is done with 2 lines of css. This is the only manual addition to the front page. 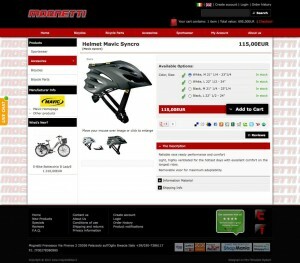 The second banner module show some products and categories that need to be highlighted. 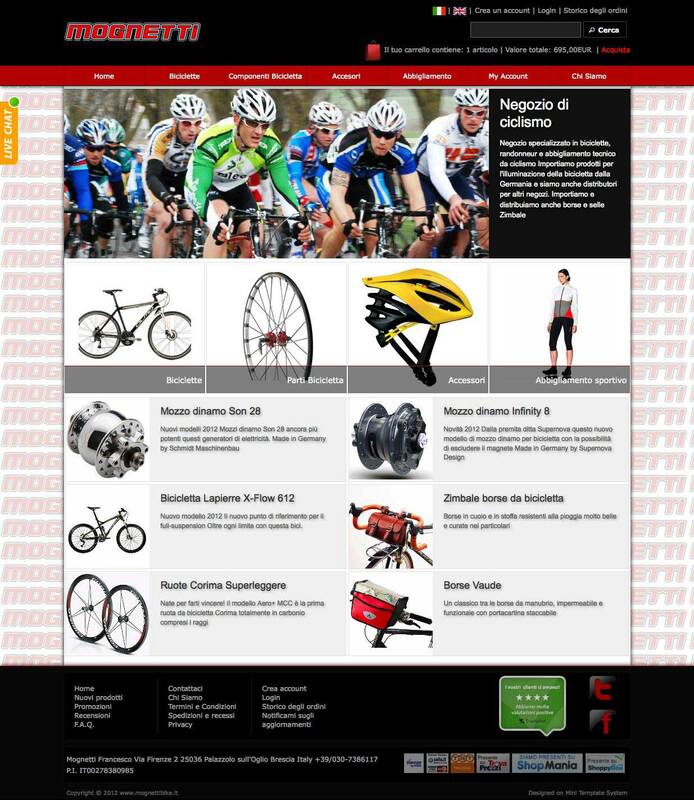 The setup is in grid mode and the content is added via the MTS banner manager the stores main categories in grid mode. The setup is done completely in the administration panel. The columns have been removed from the front page only, this was very easy to do using page profiles. If you visit the store you will see that column position and content is different depending on the page group you are on. This all happens in the administration panel, the configuration options are unlimited. The product information page shows the various options (and stock status) right on top. After that a very exposed “add to cart” button. Next, the social bookmarks area and then the buttons for reviews and pdf link in case it exist. An other page you could visit is the F.A.Q. page that has the same accordion effect as the product information page. 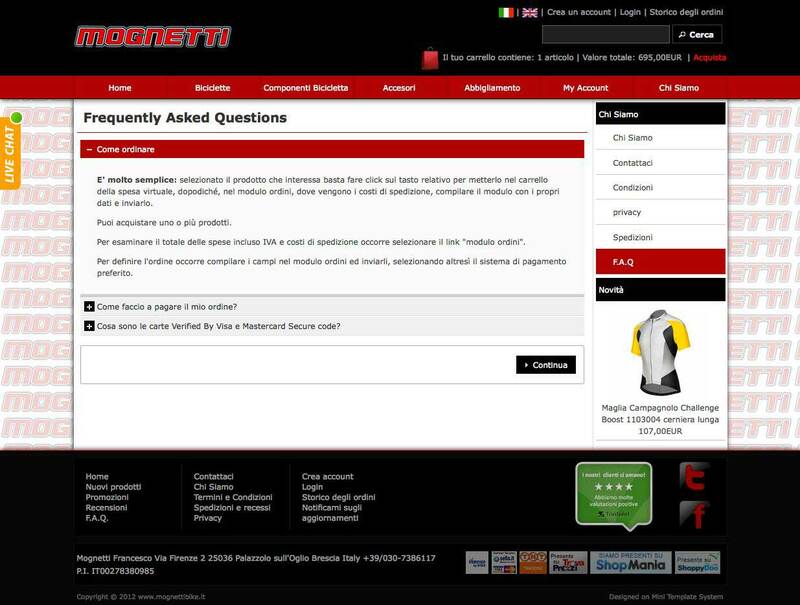 Questions and answers can be added via admin and appear on the page in this manner.